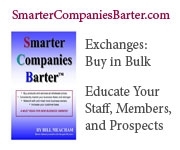 Smarter Companies Barter (Paperback) by William P Meacham Paperback $20.96. Receive a free copy with approved membership. Grow YOUR business via Barter. Barter provides a detailed road map of how to leverage barter in your business. The Business of Barter and what your accountant should know about THE BARTER. Barter has given us the opportunity to reduce overhead by using a variety of businesses; from all of our printing needs to electrical work, construction, plumbing, cleaning, and the list goes on. The Barter Authority has also given me the opportunity to use for a variety of personal needs also such as travel, home repairs, landscaping etc. Using trade for cost of goods and services has been part of helping our salon grow over the years. They have been a part of our team in business since we opened. I would recommend The Barter Authority to new and old businesses. If you are looking to keep your over head down and still get the services and products needed to help your business grow and succeed. This company can help you achieve that. By using barter services we have made many new contacts and many new friends. We have been able to increase our cash business with the use of trade dollars. I would highly recommend The Barter Authority to anyone looking to make great business connections and use these services to benefit your business as well. Thanks again for another great year of doing business. We have been a member of The Barter Authority for many years and have found it to be very advantageous for our business. By bartering, we have been able to reach a new group of customers that we probably would not have had access to. It’s perfect for businesses that have excess capacity, or inventory, that they can turn into barter dollars. I really like the fact that they are tied into the national barter system which extends the possibilities enormously. We have been able to purchase all types of services, from hotel rooms in New York City, to restaurants and entertainment, industrial shelving for our shop, gift items and many other things. I highly recommend you try The Barter Authority as a way of increasing income. I have worked with the Barter authority for well over 10 years. My experience with them has been excellent. They are very, very easy to work with. The process is extremely easy and works very well. Basically, patients call the Barter Authority and are then referred to me. I perform their treatment and I receive payments in “Barter” dollars. I use the Barter authority all the time. I have traded for multi-thousand dollar stained glass work in my house, advertising for the office, cars for my kids, painting and wallpaper in the office and everything else you can think of. Some of the best things for me have been barter dollars for vacations (hotels in various places, whitewater rafting, ziplining, log cabin rentals), dining (I have really enjoyed the Aberdeen Barn barter dollars), and local hotels when I have guests (I usually get the executive suite at the Resort and Conference center. Again, I highly recommend that you work with the Barter authority. It is a win-win!!!!! © Copyright 2017 The Barter Authority. All rights reserved and Smarter Companies Barter.